The Vegas Robaina Unicos is an astonishing and complex medium-full Pyramid, 6.1” (156mm) long, of 52 ring gauge, and comes in a 25 cigars box. What a noble pyramid cigar! Maybe the best Torpedo cigar out of Cuba, the Unico from Vegas Robaina is a real Habano that provides the closest experience of being in Cuba. 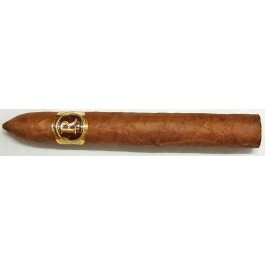 A very rich cigar that has a very neat construction and an awesome balance of aromas. The taste is very typical of Vegas Robaina puros: smooth yet vibrant with a pinch roasted coffee. Goes along well with aged spirits. The Vegas Robaina Unico is, a crowning glory of a cigar. • Very creamy aromas. A smooth cigar ideal for newcomers. • Yet it is a complex cigar. Rich in flavors for the delight of experienced aficionados. • It is light in spice, but is rich in myriad other tastes that highlight a creamy nutty highlight underpinned with rich smooth leather and earth. The Vegas Robaina Unico creates a league of its own among Habanos with its uncommon creaminess. A great looking milk chocolate, Colorado wrapper, oily, with no veins. Perfectly constructed cigar, which is firm between the fingers. The cap is very pretty and once cut it leaves a nice clean line. The pre-light draw is easy and smooth. Leathery and woody aromas. Once the cigar light-up, the burn line is neat and makes a tight light ash. The draw is still perfect. In the first third, the cigar reveals its creamy profile. The burn is nice and even. There are also some aromas of leather, soil and chocolate. Lots of smoke created. In the middle third, the cigar produces even more smoke. It is nice to enjoy longer draws at that point; the amount of smoke is delightful and allows all the flavors to appear in the foreground. The final third continues on with a rich profile. It is a stunning third and there is not much more that we can ask for. In summary, a wonderful cigar. In his first Encylcopaedia, Min Ron Nee wrote the liga of this vitola is the same you find in the Prominente, ie. Double-Corona. In fact, there is no way at all it could be similar. Never ! Even for the first issues of these cigars which were irregular in quality ; never bad but sometimes great.